Have fond memories of reading this at least a decade back in Times' speaking tree; back when it used to be original. It all came back last week when i was recounting it to my nephew. There are few more interesting things…..it continues as follows…… The hare was disappointed at losing the race and he did some soul-searching. He realized that he’d lost the race only because he had been overconfident, careless and lax. If he had not taken things for granted, there’s no way the tortoise could have beaten him. So he challenged the tortoise to another race. 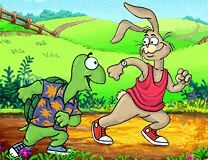 The tortoise did some thinking this time, and realized that there’s no way it can beat the hare in a race the way it was currently formatted. It thought for a while, and then challenged the hare to another race, but on a slightly different route. The hare agreed. They started off. In keeping with his self-made commitment to be consistently fast, the hare took off and ran at top speed until he came to a broad river. The finishing line was a couple of kilometres on the other side of the river. The hare sat there wondering what to do. In the meantime the tortoise trundled along, got into the river, swam to the opposite bank, continued walking and finished the race. The moral – “It’s good to be individually brilliant and to have strong core competencies; but unless you’re able to work in a team and harness each other’s core competencies, you’ll always perform below par because there will always be situations at which you’ll do poorly and someone else does well. Teamwork is mainly about situational leadership, letting the person with the relevant core competency for a situation take leadership. Note that neither the hare nor the tortoise gave up after failures. The hare decided to work harder and put in more effort after his failure. The tortoise changed his strategy because he was already working as hard as he could.” In life, when faced with failure, sometimes it is appropriate to work harder and put in more effort. Sometimes it is appropriate to change strategy and try something different. And sometimes it is appropriate to do both. 3) Never give up when faced with failure; & finally, compete against the situation – not against a rival.